"Rowena Gap (Ortley Gap), Washington/Oregon"
The Rowena Gap, also known as the "Ortley Gap", is a water gap in the Columbia River Basalts and is located at the western end of Washington's Columbia Hills. 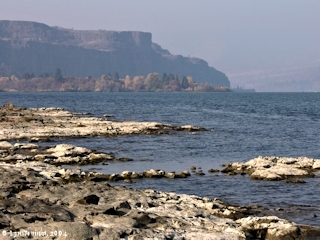 Rowena Gap extends four miles from Columbia River Mile (RM) 181 to RM 185, from the mouth of the Klickitat River, Washington and Mayer State Park, Oregon, to west of Murdock, Washington and Crates Point, Oregon. 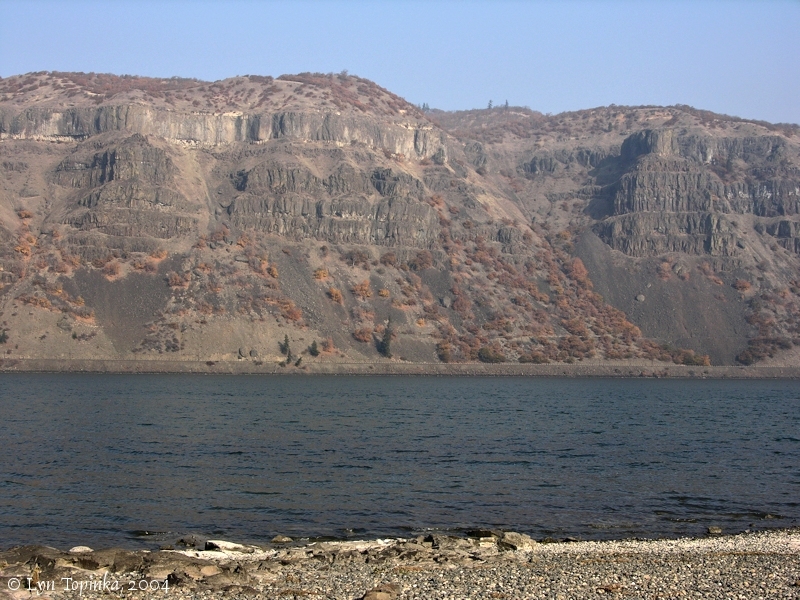 The Rowena Gap, also known as the "Ortley Gap", is 5.5 miles long by one-mile wide water gap, and resulted when the Columbia River carved a narrow channel through the Ortley Anticline, a folded feature of the Columbia River Basalts. 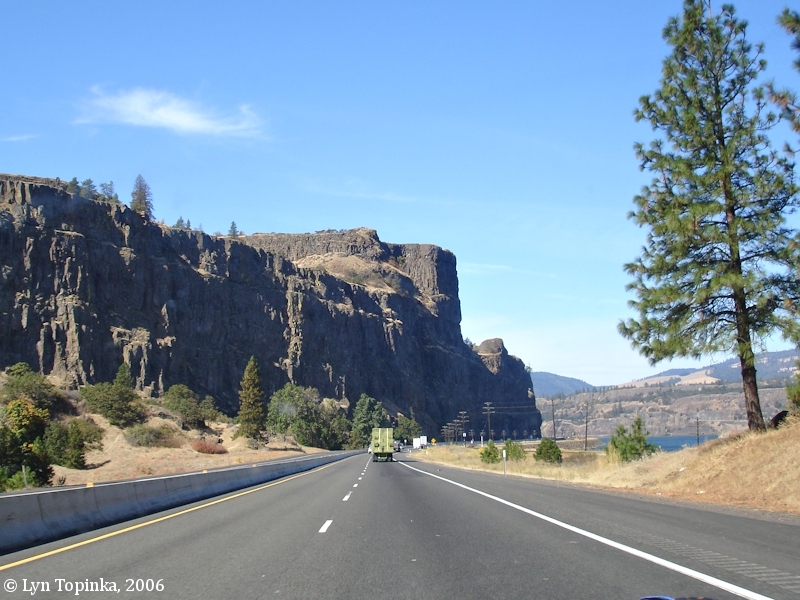 The basalt face on the Washington side of the gap is the western edge of the Ortley Anticline known as the "Columbia Hills". 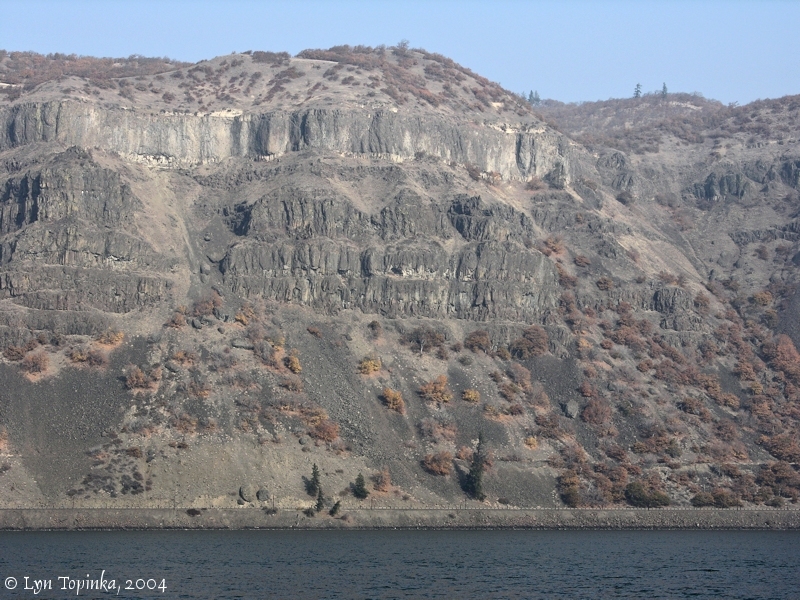 The Oregon side of the Ortley Anticline is known as the "Rowena Basalts". Six separate basalt flows can be counted in the 1,000-foot-high cliffs of the Rowena Gap. 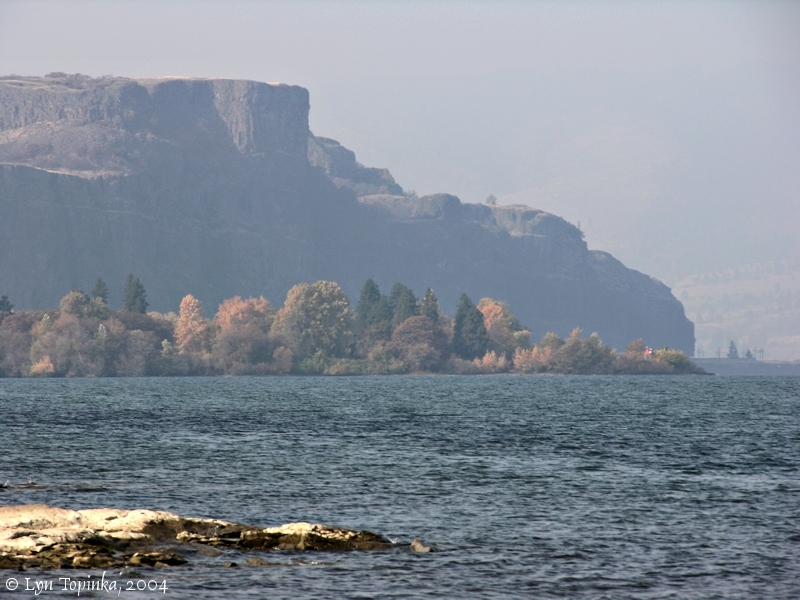 One particularly spectacular flow on the Oregon side of the Columbia River was originally known as "Cape Horn", before that name became attached to a basalt cliff further downstream. The Rowena water gap was a major constriction in the path of the Missoula Floods. Flood waters backed up for miles upstream and an eddy bar developed downstream. Click image to enlarge Chamberlain Lake as seen from Washington Highway 14, Washington. 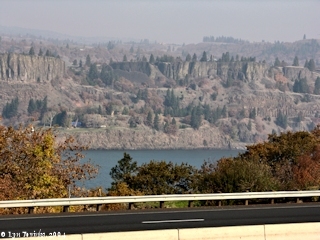 View looking east from moving car towards the Rowena Gap constriction. Image taken June 15, 2013. Lewis and Clark passed through this area on October 29, 1805. Captain Clark called the Rowena Gap "Pilgrim rocks", not as the men passed the feature on October 29, 1805, but later in his journal on December 7, 1805 as he wrote down distances. 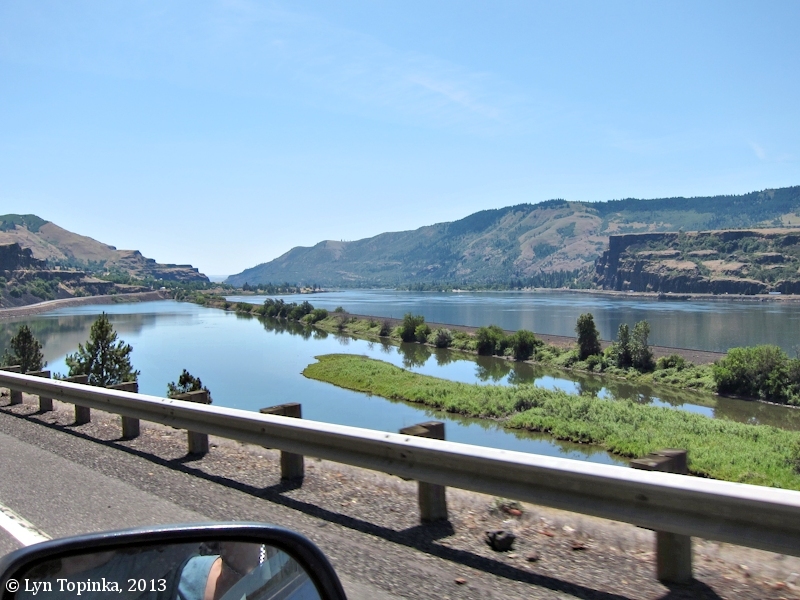 The "Catteract River" is the Klickitat River, located across the Columbia from Rowena Crest. Early explorers such as John Work in 1825 and Ross Cox in 1832 called the large basalt flow on the Oregon side of the Rowena Gap "Cape Horn". This basalt flow was the original Cape Horn on the Columbia River. On the Columbia River inset to the "Map of the Oregon Territory", 1841, by Charles Wilkes of the U.S. Exploring Expedition, the Oregon side of the Rowena Gap was labeled "Upper Cape Horn". 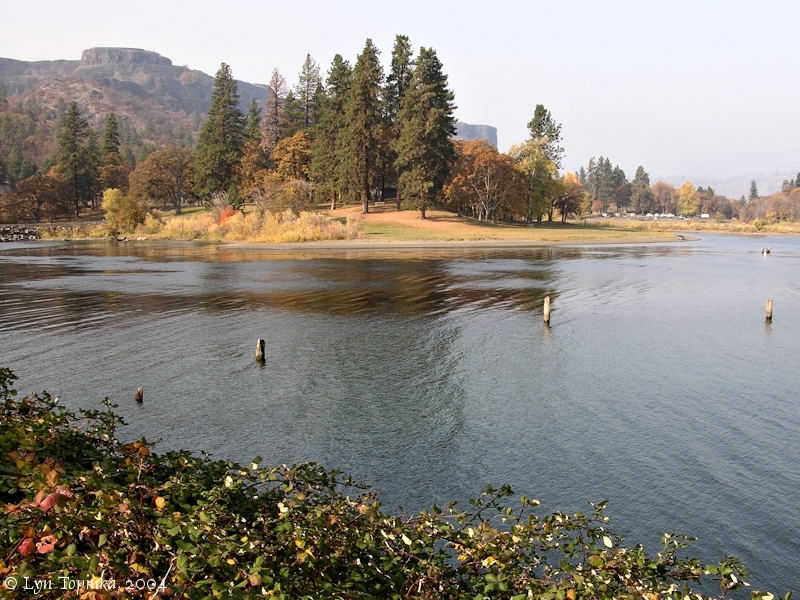 Across the river the White Salmon River was labeled the "Cathlatates R.", and upstream of the "Cathlatates R." the Washington side of the Rowena Gap was labeled "Perpendicular Rocks". The U.S. Board of Geographic Names made the name "Rowena Gap" official in 1966, and states the Gap is 5.5 miles long by 1 mile wide. 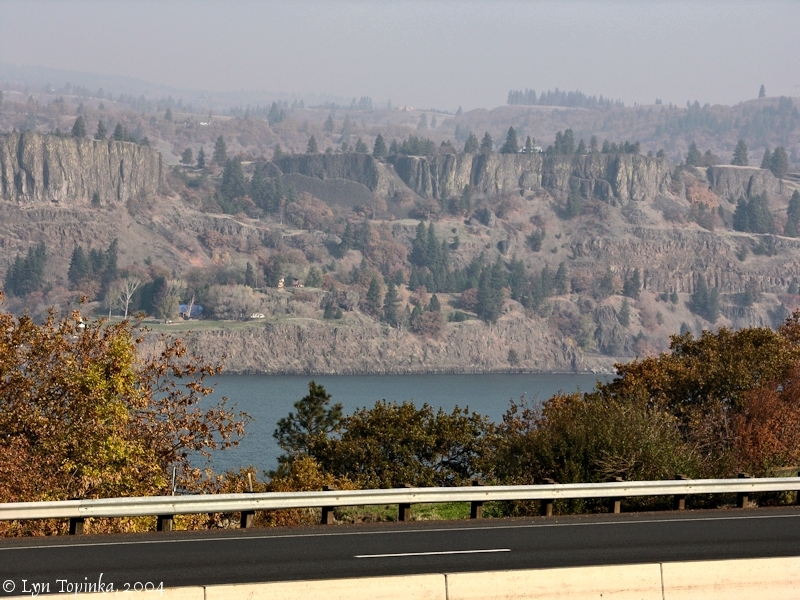 Click image to enlarge Rowena basalts and Interstate 84, Oregon. 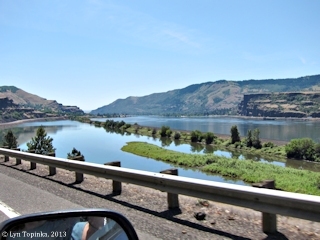 View is through car window as seen from Interstate 84 heading west. Image taken October 2, 2006. Click image to enlarge Rowena Gap basalts, Washington side, as seen from Interstate 84, Oregon. Image taken November 11, 2004. Click image to enlarge Rowena Gap basalts, Washington side, from Mayer State Park, Oregon. Image taken November 11, 2004. 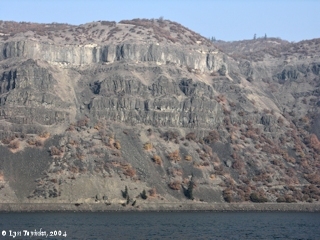 Click image to enlarge Rowena Gap basalts, Oregon side, as seend from Mayer State Park, Oregon. Image taken November 11, 2004. 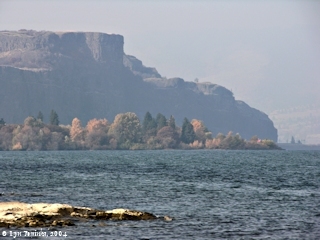 Click image to enlarge Rowena basalts, Oregon side, as seen from Mayer State Park, Oregon. Image taken November 11, 2004. 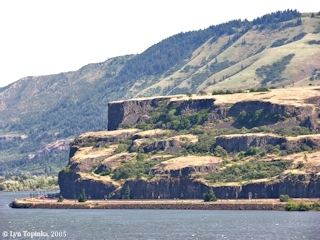 Throughout history there have been five different features named "Cape Horn" located along the Columbia River, one of them being a basalt flow at today's Rowena Gap. This was the first "Columbia River Cape Horn". 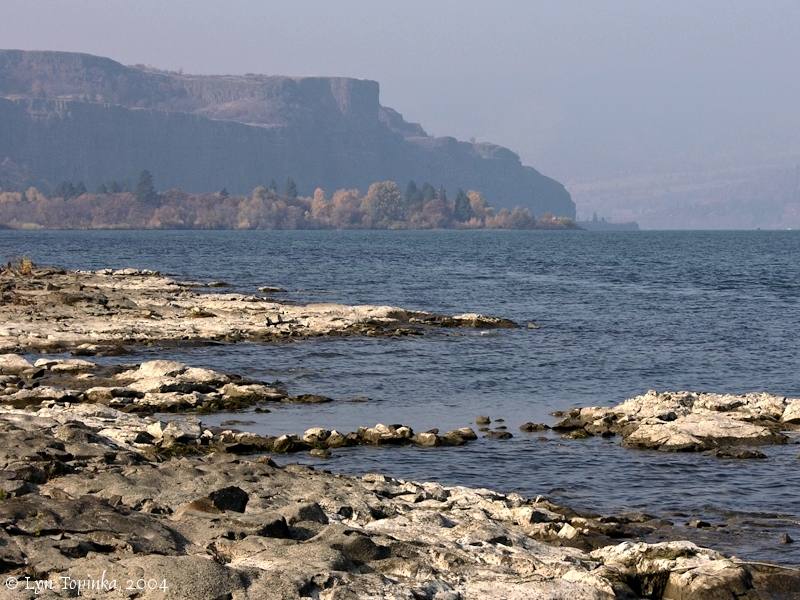 Click image to enlarge Rowena Gap Basalt Flow, Oregon, as seen from Chamberlain Lake Rest Area, Washington. Image taken June 4, 2005. 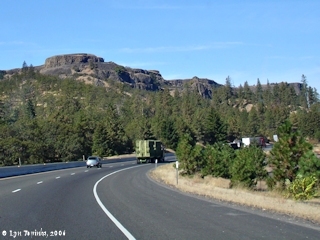 On the Oregon side of the Rowena Gap lies a prominent feature called Rowena Crest. Rowena Crest is a viewpoint along the Historic Columbia River Highway. Click image to enlarge Rowena Crest, Oregon, (upper left), as seen from Mayer State Park, Oregon. Image taken November 11, 2004.